Organizers of the annual Renewable Energy Summit next month in Milwaukee have landed a high-profile keynote speaker – outspoken climate scientist James Hansen. Hansen, director of the Goddard Institute for Space Studies, an arm of the National Aeronautics and Space Administration, was among the first climate scientists to speak out about global warming, warning about the problem in testimony to Congress in 1988. In recent years, he has become more outspoken about the need to address global warming. In 2006, he criticized his superiors in the Bush administration for efforts to limit his comments to the media about climate change. Hansen agreed to address the Wisconsin energy event on March 25 after receiving an invitation from George Stone, an instructor of physical science at Milwaukee Area Technical College. Stone introduced Hansen at a Geological Society of America conference last fall. The involvement of Hansen in the event comes as the Obama and Doyle administrations are considering legislation to limit emissions of greenhouse gases. Organizers of the energy summit say Hansen's involvement will help raise the profile of an event that has doubled in attendance every year for five years. At least 2,500 people are expected to attend this this year. STURTEVANT, Wis.--(BUSINESS WIRE)--BetaLED is testing two leading forms of lighting control systems with its LEDway streetlights. Eleven LEDway streetlights installed along 92nd Street in Sturtevant, Wis., were recently outfitted with either a power line communication system or wireless radio frequency (RF) system as part of a side-by-side demonstration of lighting control technologies available for LED streetlights. Both lighting control systems are designed to manage each fixture to ultimately reduce operating and energy expenses. Milwaukee based We Energies is taking part in the evaluation, testing the remote access and monitoring capabilities of each system as well as calculating reduced energy and maintenance costs presented by LED technology compared to existing streetlighting options. Although the two independent lighting control systems are designed primarily to lower operating costs, they use different technology to realize results. The power line system communicates over the same wires that deliver power to each fixture to monitor and control streetlights equipped with specially designed hardware and software. Snug Haven Farms' spinach has been featured on the menu at upscale restaurants like L'Etoile, and this weekend, farmers Judy Hageman and Bill Warner will talk about their success at the 20th annual Organic Farming Conference in La Crosse. Their class, which focuses on how to grow the dark green veggie in hoop houses, is just one of many planned for the conference, which runs from Thursday, Feb. 26, to Saturday, Feb. 28. The event is expected to draw more than 2,000 people from across the United States and a few foreign countries. "This conference is the biggest one in the country for organic farmers, and it's just a great experience, whether it's your first time or you've been a part of it from the beginning," said Hageman, who grows spinach in Belleville and regularly sells her produce at the Dane County Farmers' Market. "There is so much hands-on information, and everyone is willing to share what they know. You just have light bulbs going off the whole time you're there. The exhibits are terrific, and the food is magnificent, too." WPPI Energy has established a $10 million revolving loan fund to make zero-interest loans to help its members lead by example in the areas of energy efficiency, conservation and the use of renewable energy. WPPI Energy’s members include 49 municipalities in Wisconsin, Michigan’s Upper Peninsula and Iowa, and one Upper Michigan cooperative electric association. The WPPI Energy Member Loan Program is designed to help members implement energy efficiency and renewable energy projects on utility and other municipally owned property, thereby lowering operating costs and meeting members' local energy needs with local renewable resources. The time to green your resume is now. The federal Green Jobs Act got a $500 million boost from the economic stimulus package and is expected to train 70,000 workers in renewable-energy and energy-efficiency jobs. Plus, a floundering economy is nudging companies to hire employees to design and implement energy-savings plans and other cost-saving measures. Wisconsin Environment Director Dan Kohler is pleased with the strategy for building a greener workforce—particularly on the state and local levels. “The federal recovery plan includes significant funding to help states design educational programs to get workers moving ahead in the green economy,” he says. In Wisconsin, universities, technical colleges and government and community workforce-development agencies will all play a role in the training effort. Gov. Jim Doyle’s global-warming task force has been helping these institutions team up with the private sector to develop a comprehensive training strategy that will address job seekers with a variety of different skill sets. Meanwhile, local colleges are rushing to design courses and curricula in a wide variety of green disciplines, from sustainable operations management to water technology. Though a full graduate-level program is still in the works, UW-Milwaukee’s School of Freshwater Sciences is offering courses in freshwater ecosystem health and a variety of other topics. At Milwaukee Area Technical College (MATC), there’s a comprehensive selection of green career paths, including new programs in environmental and water technology, sustainable operations, and energy engineering. There are also numerous opportunities for people to add green credentials to their existing skill set at Lakeshore Technical College, Gateway Technical College and MATC. The Wisconsin Renewable Energy Summit at the Midwest Airline Center includes a career/jobs day on March 27. Schools and other training organizations, as well as employers, will be set up in the exhibition hall. Richland Center--With Governor Doyle’s recent announcement of a new biomass boiler at the UW Madison Charter Street Power Plant to use 250,000 tons of biomass annually, southern Wisconsin has become a prime target for biomass production. Two other proposed plants will use a combined 800,000 tons of biomass per year in Cassville, WI and just across the border in Carroll County, Illinois. Southwest Badger Resource Conservation and Development (RC&D) Council, Inc. is holding a biomass briefing on March 6, 2009 in Richland Center. “Southwest Wisconsin is the Saudi Arabia of biomass such as wood, switchgrass, and corn stover. The challenge is harvesting it sustainably,” said Steve Bertjens, NRCS Coordinator for Southwest Badger RC&D Council. The briefing will provide interim reports on 3 current SW Badger projects-- the Biomass Inventory and Analysis Project, Switchgrass Establishment and Harvesting Demonstrations, and the True Costs of Harvesting Woody Biomass in the Driftless Area of Wisconsin. The SW Badger Biomass Briefing is free to the public and will be held at the Ramada White House, 1450 Veterans Drive, Richland Center, WI from 1-3:30 p.m. on Friday March 6th. Brett Hulsey, president of Better Environmental Solutions, said, “This Biomass Briefing will answer questions like, ‘Where will a million tons of biomass per year come from?’ and ‘Is biomass production and use a sustainable renewable energy source?’.” Hulsey will also be presenting yield data collected from warm season fields currently enrolled in the Conservation Reserve Program (CRP). University of Wisconsin Extension Weed Specialist Mark Renz will present the first year results from the “Switchgrass Establishment and Harvesting Demonstrations.” This project is working to quantify achievable yields and develop best practices for growing switchgrass. Last spring the Council established 62 acres of warm season grass plantings on six farms using a variety of establishment treatments on each farm. Renz and his research students are collecting field data on the demonstrations like establishment success, yield per treatment, above and below ground production, carbon sequestration and greenhouse gas flux. State law exempts wind, solar, and anaerobic digester systems from the sales and use tax, effective July 2009. In order to be considered an eligible product, devices must be capable of producing at least 200 watts of alternating current or 600 British thermal units per day. The exemption under does not apply to uninterruptible power sources that are designed primarily for computers. The law also exempts "receipts from the sale of and the storage, use, or other consumption of electricity or energy" produced by a qualifying system. Building a 17-mile pipeline to carry landfill gas from Muskego to the Jones Island sewage treatment plant on Lake Michigan will save the Milwaukee Metropolitan Sewerage District, its customers and property-tax payers at least $148 million in the next two decades, Milwaukee Mayor Tom Barrett and sewerage district officials said Monday. The bulk of the savings will come from buying landfill gas at just 48% of the price of natural gas, under terms of an agreement negotiated with Veolia ES, owner of the Emerald Park landfill in Muskego. There could be additional savings to property-tax payers in the district if federal stimulus money is used to pay even part of the estimated $22 million in pipeline construction costs, sewerage district Executive Director Kevin Shafer said. Milwaukee Mayor Tom Barrett was in Washington on Friday to learn more about stimulus programs, and he said Monday that this project should be a good fit: It could be started quickly and it is environmentally friendly. "We're going to be pitching this thing as hard as we can" to federal and state agencies, Barrett said in an interview. . . . The landfill gas at Muskego is between 50% and 55% methane and will replace natural gas as the fuel for 12 sewage sludge dryers inside the Milorganite fertilizer production facility at Jones Island, under the proposal. Cost of converting the dryers to burn landfill gas is included in the $22 million construction estimate, Shafer said. Pipeline work is scheduled to begin in July of this year, with a goal of completing the work by Jan. 1, 2011. Three possible pipeline routes being studied would use existing state Department of Transportation easements adjacent to highways and freeways. Burning landfill gas in the dryers will save at least $113 million in the first 20 years, Shafer said. And there is an estimated 40-year supply at the landfill. In 2009, the district has budgeted spending $13.2 million for natural gas. "This project will bring big savings to MMSD customers," Barrett said. The Miller-Coors brewery alone should pay $5.9 million less in user charges - an 11.5% drop - during that period. "This will help retain and grow businesses," Barrett said. ASHLAND, Wis. (Press Release) - Following more than a year of study and planning, Xcel Energy announced it has filed an application for a Certificate of Authority with the Public Service Commission of Wisconsin (PSCW) to install biomass gasification technology at its Bay Front Power Plant in Ashland. When completed, the project will convert the plant's remaining coal-fired unit to biomass gasification technology, allowing it to use 100 percent biomass in all three boilers and making it the largest biomass plant in the Midwest. Currently, two of the three operating units at Bay Front use biomass as their primary fuel to generate electricity. The project, estimated at $58 million, will require additional biomass receiving and handling facilities at the plant, an external gasifier, minor modifications to the plant's remaining coal-fired boiler and an enhanced air quality control system. The total generation output of the plant is not expected to change significantly as a result of the project. . . . The Bay Front Power Plant was originally constructed and began operation in 1916. In 1960, it operated five boilers and six turbines. Since then, two of the boilers, and three of the turbines, have been retired. The three remaining boilers feed into a combined steam header system that can support three turbine-generator sets. 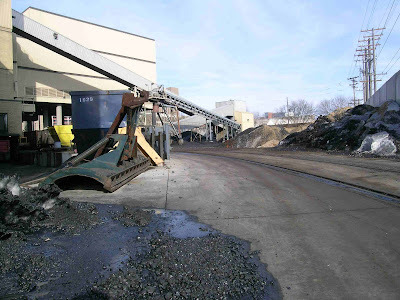 During a major plant improvement project completed in 1991, the plant was equipped with an upgraded air quality control system, which includes two gravel bed filters designed to remove more than 98 percent of particulate matter. Last year, Xcel Energy installed NOx (nitrogen oxide) emission control equipment on the two boilers that primarily burn wood, allowing both to continue to operate into the foreseeable future. When evaluating various alternatives for the remaining boiler, which primarily burns coal, it was determined that expanding Bay Front as a biomass resource was preferred over incurring significant environmental compliance costs relating to the Clean Air Interstate Rule and regulations on mercury emissions. . . . When complete, the project will reduce emissions of nitrogen oxides by more than 60 percent, sulfur dioxides by more than 80 percent and particulate matter by more than 80 percent. In addition, displacing coal with sustainably harvested biomass will also reduce net carbon dioxide emissions, contributing to the company and state of Wisconsin's carbon management goals. The primary source of biomass at Bay Front is expected to be the lower quality, unused materials that are currently left in area forests following traditional harvests, such as treetops, logging slash, damaged trees, underutilized species, and the cull and mortality classed trees. Initial investigations conducted by Xcel Energy show more than ample supplies of this lower quality biomass within the area. To ensure future biomass supplies are available on a reliable basis, Xcel Energy is working with the Wisconsin Office of Energy Independence, University of Wisconsin-Madison and local agricultural experts to explore the feasibility of developing biomass plantations and grower cooperatives. "Xcel Energy has been a long-time leader in providing renewable energy from local sources to the citizens of Wisconsin," said Michael Vickerman, executive director, RENEW Wisconsin. Mark Redsten, executive director, Clean Wisconsin, agreed. Refreshments provided. Please bring your reusable mug. All are welcome to this free presentation! A presentation on The Natural Step (TNS) Framework, a methodology for planning that provides an elegant, rigorous, science-based understanding of sustainability together with a tested planning approach to translate that understanding into practice. Participants will learn about the principles of the TNS Framework and how it is being applied in communities across Wisconsin and around the world. Participants will have the opportunity to sign up for a local study circle. Speaker: Peter Henry, a veteran professional in the field of energy conservation and renewable energy technologies. After 20 years as a secondary teacher, Mr. Henry recently took a position with the Hudson-based engineering firm Energy Concepts, a regional leader in the design and installation of wind and solar energy applications. A resident of Amery, Mr. Henry is the current chair of the Apple River Association, a citizen group working to protect Polk County’s largest river system. He is also vice-president of Friend of Amery-Dresser State Trail and has been active in both the Amery Natural Step program and the regional Western Wisconsin Initiative for Sustainable Communities. Although it’s winter, local college campuses look greener than ever. La Crosse campuses are promoting recycling and energy conservation initiatives this year. “In my eyes, the best place to set an example for everyone else in the community is at a university,” said Matt Groshek, a University of Wisconsin-La Crosse senior and environmental sustainability director for the UW-L Student Association. UW-L students voted last year to tag an additional $5 per semester onto tuition for a Green Fund for renewable energy and energy-efficiency projects. Chancellor Joe Gow also signed the Talloires Declaration, a 10-point plan committing the university to environmental issues. One point was to set up practices of resource conservation, recycling, waste reduction and environmentally sound operations. Sustainability efforts since have snowballed, said Groshek. UW-L is competing in Recyclemania, a challenge among colleges and universities nationwide to see which campus can reduce, reuse and recycle the most campus waste from Jan. 18 to March 28. UW-L now ranks 183rd among 287 colleges and universities, recycling an average of about 2 pounds per person over two weeks, according to the Recyclemania Web site. UW-L residence halls are taking on the “Chancellor’s Energy Challenge” to see which hall can conserve the most energy in one month through March 8. A tree will be planted on campus to honor the winning hall. “The biggest challenge to making conservation changes are getting people to look at the decisions they make on a daily basis a little differently,” said Dan Sweetman, environmental and sustainability program manager at UW-L.
Another La Crosse campus has ramped up its efforts to conserve energy and recycle as well. Recycling has increased each month since Viterbo University doubled the number of recycle bins and color coded them on campus in August, said Dennis Kolb, assistant director of Viterbo’s physical plant. The university also decided to turn down all building thermostats a few notches to 69 degrees this semester to save energy, he said. WAUSAU, Wis. -- A northern Wisconsin company is one example of how President Barack Obama hopes his stimulus plan will help the economy. PDM Solar in Wausau received a $200,000 grant from Wisconsin's Energy Independence Fund, which gives money to companies working on renewable energy projects. PDM said it hopes to hire hundreds of Wisconsin workers over the next five years to mass-produce its solar-powered air conditioner. "We're taking a technology that was, you know, 100 years, 120 years old, and packaging it differently and using it in an application that has never been used before," said David Baker with PDM Solar. In order to mass-produce the product, the company will need assembly-line workers, engineers and workspace. The company will build its first solar air conditioner in Phoenix. The economic stimulus package approved last week gives Wisconsin and other states an opportunity to ease the financial crisis by doing more than just making ends meet. Money in the package aimed at energy projects provides an opportunity to move from an economy too reliant on fossil fuels and toward an economy based on sustainable green energy. Wisconsin businesses and governments should receive at least $276 million, and possibly more, in energy-related funds from the economic stimulus bill, according to the state agency in charge of the recovery. Energy provisions in the stimulus package include funding for efforts to make buildings more efficient and to boost the use of renewable energy sources such as wind turbines and solar panels. Also included are tax credits for manufacturers of energy technologies and for consumers who improve the energy efficiency of their homes or buy plug-in hybrid cars. For instance, homeowners will get credits of up to $1,500 for energy upgrades, such as purchases of qualified furnaces and insulation. Wisconsin is likely to receive $146 million to weatherize some of the most inefficient buildings in the state. An additional $130 million or so is expected under two kinds of grants for energy-efficiency and other projects. And Johnson Controls, the state's largest company, is in a great position to take advantage of the stimulus money for its own work in energy efficiency. There are opportunities here, too, for governments and their taxpayers. Making school buildings more energy efficient, for example, would reduce energy bills, allowing districts to spend money on textbooks or teachers or to reduce taxes, and put people to work retrofitting buildings. That kind of spending is a real win-win. Times are hard. But using the stimulus money to help foster a greener economy could position Wisconsin for a healthier and more prosperous future. Go inside the core and climb to the very top of a Vestas V82 wind turbine in the Top of Iowa 3 Wind Farm. From Madison Gas and Electric' renewable energy channel Green View. Johnson Controls has begun generating electricity from the largest solar power system in the state - nearly 1,500 panels erected on the northeast corner of the company's headquarters campus in Glendale. The solar power system is part of the $73 million renovation and rehabilitation of the headquarters campus and power solutions businesses for the state's largest company - and will be a showpiece for Johnson Controls as it tries to persuade customers to incorporate renewable energy into their buildings. Power began generating this month after We Energies commissioned the solar system, said Don Albinger, vice president of renewable energy solutions at Johnson Controls. The expansion of solar power is timely, coming as the stimulus package was signed into law. Energy experts are marveling at the array of tax benefits aimed at bringing more renewable energy online quickly, such as provisions that provide federal loan guarantees and accelerated depreciation for renewable projects. "In these dismal times, we've got to look for some bright spots, and to me a great bright spot is the stuff that's involved with renewable energy in that stimulus bill," said Art Harrington, an energy lawyer with Godfrey & Kahn in Milwaukee. Godfrey hosted three meetings across the state this week that drew about 500 businesspeople looking to learn more about economic opportunities created by the stimulus law, Harrington said. "My advice to clients is to get knowledgeable on this stimulus bill," he said. "Get knowledgeable quickly and then follow the money." The Wisconsin State Fair Park has received state approval to install a solar panel system on the roof of the Wisconsin Products Pavilion. State Fair Park will use the $306,000 demonstration project to promote renewable energy. The 30-kilowatt solar panel system is expected to be in place for the 2009 Wisconsin State Fair Aug. 6-16. The project received the approval of the State of Wisconsin Building Commission. The electricity created by the solar panel system will be integrated into the Fair Park’s power grid to help reduce energy consumption. The new system will reduce carbon dioxide emissions into the atmosphere by more than 31 tons per year, according to the State Fair Park board. The state Building Commission approved $128,400 of state funding from Conserve Wisconsin for the project at its meeting Wednesday. State Fair Park is applying for up to $100,000 in funds from the We Energies Nonprofit Renewable Energy Grant Program, in addition to applying for a $50,000 grant from Focus on Energy. A Wisconsin grant program to foster sales of locally grown food has generated more than $2 in sales for every $1 given in grants. That's according to a new report from the Wisconsin Department of Agriculture, Trade and Consumer Protection. The department gave $225,000 worth of grants last year in its new Buy Local Buy Wisconsin program. Grant recipients reported nearly $584,000 in new sales in the program's first six months. The DATCP report said the grant recipients also reported sales to new customers who don't usually buy from farms, such as hospitals and tourists. The 5th annual Small Wind Conference is scheduled for June 16-17, 2009 at the Holiday Inn and Convention Center in Stevens Point, WI. This is the only Small Wind Power Conference of its kind in the Nation. The Conference welcomes small wind installers, manufacturers, site assessors, dealers, distributors, state representatives and zoning officials and policy makers. Interested parties should contact Kirsten at 715-592-6595 or register online. Lt. Governor Barbara Lawton today announced that the Fennimore Community School District accepted the Lt. Governor’s Energy Star School Challenge, a commitment to reduce energy consumption by ten percent. Lt. Governor Lawton issued her Energy Star School Challenge in April of 2008 as part of her Green Economy Agenda. Lawton said that her goal for the challenge is to commit at least 100 new school districts, nearly 25 percent of all Wisconsin school districts, to reduce their energy costs by at least 10 percent. + Make a commitment to improve energy efficiency by 10 percent or more. + Measure and track the energy performance of the district facilities where possible. Tools are available through the Environmental Protection Agency (EPA) Energy Star program at no cost. + Develop and implement a plan consistent with the EPA Energy Star Energy Management Guidelines to achieve energy savings. + Educate staff and community members about energy efficiency. . . . According to the EPA, U.S. schools currently spend $6 billion a year on energy costs, more than they spend on textbooks and computers combined. Inefficient technologies and design rob them of an average of 20% of that energy purchased. Wisconsin businesses and governments should receive at least $276 million, and possibly much more, in energy-related funds from the economic stimulus bill that President Barack Obama signed Tuesday, according to the state agency in charge of the recovery. Energy provisions in the stimulus package include funding for efforts to make buildings more efficient and to boost the use of renewable energy sources such as wind turbines and solar panels. Wisconsin is likely to receive $146 million to weatherize some of the most inefficient buildings in the state. An additional $130 million or so is expected under two kinds of grants for energy-efficiency and other projects, said David Jenkins, who is handling energy projects for the state Office of Recovery and Reinvestment. "In addition to that money, there are 11 different energy- and energy-science-related competitive grant programs, some of which hold promise for Wisconsin," he said. "Our companies and universities and technical colleges are going to do a good job of competing for that money." The joint city-county sustainability plan could be challenged at Thursday’s meeting of the La Crosse County Board. The plan calls for greater energy efficiency, the use of cleaner energy and practices that don’t harm the environment. It also calls for community education, the availability of living-wage jobs, access to affordable housing and health care, and opportunities for recreation and the arts. The plan includes such recommendations as increased mass transit, a shared-car program similar to one being offered in Madison and efforts to encourage more city employees to live in La Crosse and more city and county employees to live closer to where they work. With his yellow rain slicker, reflective vest and helmet-mounted headlight, it’s hard to miss Kurt Oettel as he pedals to work. Oettel, 44, rides about 21/2 miles each way from his home on 24th Street to Gundersen Lutheran, where he works as an oncologist. He rarely misses a day. “I took off those three days when there was a 35 below wind chill,” he admitted. For Oettel, who with his wife has three kids, one car and 11 bicycles, biking to work started as a necessity but continues out of a passion for biking and for conserving energy. A new law that took effect Jan. 1 provides a monetary benefit for commuters like him and an incentive for others to get on their bikes. According to the law, commuters can collect $20 a month for bike-related expenses; employers can deduct the expense from their taxes. The credit, which extends benefits already available to parking and public transit users, was included in last fall’s controversial $700 billion financial industry bailout. Ironically, the measure’s sponsor, Rep. Earl Blumenauer, voted against it. The Oregon Democrat, who wears a bicycle lapel pin and spent years pushing for the credit, opposed the rescue bill, calling it too expensive and ineffective. Exactly how the law will be applied — how often do you have to ride to work to be a bicycle commuter? — isn’t clear. The IRS has not issued specific guidance on the rule, said spokesman Christopher Miller. “A lot of things are not completely explained yet,” said Meghan Cahill, communications director for the League of American Bicyclists, which applauds the law. Employees will have to produce receipts to document they spent money — on a bike, accessories or repairs — said Mary Jo Werner, a CPA with Wipfli LLP in La Crosse. It’s not clear from the law whether it’s mandatory for employers to offer the benefit. Carl Johnson, owner of Smith Cycling and Fitness, hasn’t figured out how it will work but plans on offering the credit. He has about 10 employees who could qualify as bike commuters. 1. Improving existing renewable energy technologies such as wind, solar, and biomass. 2. Expanding renewable distributed-generation technologies and related technologies, such as energy storage and smart grid technologies that directly benefit the integration and distribution of renewable energy onto the grid. 3. Developing renewable energy technologies, products and services that provide more affordable electricity and improved reliability. 4. Conducting longer-term research on advanced renewable technologies that will help meet tomorrow's electricity needs and contribute positively to the renewable energy industry. A proposed research project must be located within We Energies electric service territory, or if not located within the service territory it must clearly provide local benefits to the electric service territory. Grants are not intended to offset the cost of purchasing small renewable systems such as a residential photovoltaic installations and/or a small wind turbine on a farm, but rather are intended for research and development endeavors that will clearly advance a technology or product, and will clearly contribute positively to the renewable energy industry. . . .
We Energies offers grant funds up to a maximum grant of $200,000 per project. Although matching funds are not required for this grant program, any additional funding that can be added to the proposal is considered a favorable element of the project and increases the chances for a successful grant. In addition, as noted above, We Energies grant funds may potentially be used as matching funds toward a larger state or federal grant program, provided project activities meet this program’s requirements and intent. Only one R&D grant will be awarded per applicant per program year. Exceptions will be made for Universities and similar type organizations where separate project applications may be received from different departments within the organization in one calendar year. In those cases, only one successful grant will be awarded to a specific department in a calendar year. . . .
relationship and roles of each party, also must be included in your application. . . . The ReNew the Earth Institute is a place where people of all ages can learn about renewable energy, energy efficiency, sustainable living, and other environmental issues. The Institute has working renewable energy systems, hands-on educational displays, demonstration gardens, a resource library, and a workshop/conference room. . . .
About 175 people gathered this morning in the auditorium at the Schlitz Audubon Nature Center to talk about ways to green their company’s environmental footprint and save some money at the same time. Companies are looking to reduce their energy and water bill costs by taking steps to make their processes more efficient. It’s all about applying the quality-improvement techniques that companies are by now long familiar with – lean manufacturing, Six Sigma – and adapting them to their use of resources such as energy and water, said Joseph Jacobsen, associate dean at Milwaukee Area Technical College. What’s causing the shift to thinking green? Business owners can sense that carbon regulations are coming and want to get ready, while others are realizing that saving energy and water helps save -- or stem the rise – in utility bills. “Green is not just environmental sustainability. Green is business sustainability too,” said Jon Dommissee, director of new product development and marketing at Bradley Corp.
Bradley, a local maker of plumbing fixtures, and the state Focus on Energy were sponsors of this morning's Green Manufacturing Summit, and the Journal Sentinel was media sponsor. Friday, March 13, 2009, 8 a.m. – 5 p.m.
More companies are looking to reduce their energy and water utility bills by taking steps to make their processes more efficient. It's all about adapting the quality-improvement techniques that many companies are already using, said Joseph Jacobsen, associate dean at Milwaukee Area Technical College. What's making people turn to green? Businesses know that carbon regulations are coming and want to get ready, and they are realizing that saving energy and water helps save - or stem the rise - in utility bills. "Green is not just environmental sustainability. Green is business sustainability too," said Jon Dommissee, director of new product development and marketing at Bradley Corp.
Jacobsen and Dommissee spoke during a Green Manufacturing Summit held Thursday at the Schlitz Audubon Nature Center in Bayside. Bradley, a local maker of plumbing fixtures, and the state Focus on Energy sponsored the event, along with the Journal Sentinel. Despite the slowing economy, companies continue to seek grants from Focus on Energy to help them pay for energy-saving projects, said Nate Altfeather of Focus. Focus provides grants that help shorten the payback time on projects that boost energy efficiency. With companies holding the line on spending, the types of incentives sought from Focus may shift. "We're going to see a lot more interest in low and no-cost maintenance incentives," Altfeather said. "People aren't going to be able to cut checks for $100,000 for new equipment." Focus is developing new incentives designed to help companies with energy-saving upgrades that have a payback of one year or less. The Focus program, funded through charges on utility bills, will pay nearly 100% of an energy audit for those firms, Altfeather said. Eau Claire (News Release) - With the Wisconsin Department of Transportation in Eau Claire today to receive public comment on its "Connections 2030" long-range transportation plan, the West Central Wisconsin Rail Coalition is seeking changes to the plan that would include the region in WisDOT's plans for a high speed rail network. Members of the coalition applaud much of the philosophy of the draft Connections 2030 plan, which includes a major state policy goal to provide Wisconsin citizens with more transportation choice by improving passenger train service and other non-automobile travel options. In the draft plan, WisDOT says it "envisions a 21st century intercity passenger rail system that links the Midwest region's major economic centers." Unfortunately, West Central Wisconsin is not included in that network, which would be built in three phases with routes serving Chicago-Milwaukee-Madison-La Crosse-St. Paul and Milwaukee-Green Bay. The plan only promises to "consider" service to area once the entire network is completed more than a decade from now. The Coalition points out that West Central Wisconsin - which encompasses the Chippewa Valley and St. Croix Valley areas from Eau Claire/Chippewa Falls through Menomonie and Hudson/River Falls - is one of the fastest growing population areas in the state, growth that could be stunted if the area is left out of the network. CASSVILLE, Wis. -- Pending a state Department of Natural Resources air-quality hearing next week and the ensuing public comment period, work should start on converting a Cassville power plant from coal to 100 percent renewable fuel. In May, DTE Energy Services, of Ann Arbor, Mich., announced it was purchasing the E. J. Stoneman power plant. DTE said it planned to convert the coal-fired plant to burn wood waste, a renewable fuel. The Stoneman facility was built in 1950. Integrys Energy Services bought the 53-megawatt capacity plant in 1996 from Dairyland Power Cooperative and operated it as a merchant power plant, selling power in the open market. This is DTE Energy's initial foray into Wisconsin. Once the air permit is issued, the project will move forward, DTE officials say. The plant probably will be pulled off-line by the end of this month, with demolition and construction to take place during the summer. The plant could be back online as early as June 2010. Work includes converting the boilers from burning pulverized coal to a stoker technology and conversion of the material handling process. It is estimated the project will use 40 people at the peak of the effort. One hurdle on this project was convincing the sub-division association that the solar panels would not take away from the development’s overall aesthetics and that it complied with existing covenants, which it did. 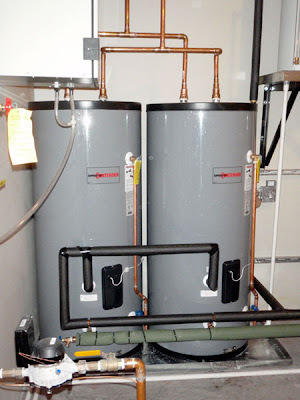 This is a custom-designed combination domestic hot water and in-floor space heating system. 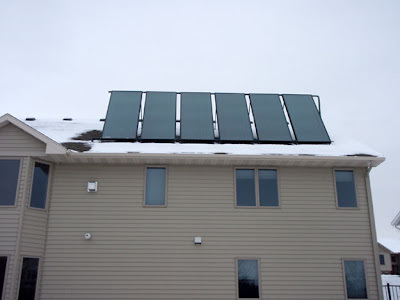 The homeowners received $2,500 for the project from a Focus on Energy Hot Water Grant and another $3,500 from the Solar Space Heaitng Progam, a program of utility members of WPPI Energy. Two 119-gallon tanks (below) hold the solar heated water until it circulates under the floors to heat the house. YORKVILLE — The County Board decided Tuesday to delay its vote on a regional transit authority until its next meeting on Feb. 24, but many citizens showed up in the board chambers to voice their opinions. Although Kenosha-Racine-Milwaukee commuter rail has been the focus of most comments, the proposal sent to Gov. Jim Doyle is broader than that. It suggests that the state create a permanent regional transit authority which could be joined by municipalities in southeastern Wisconsin. This permanent RTA would oversee not only a commuter rail project but also integration of the various bus systems, and it would have the authority to replace local property tax support of mass transit with a sales tax of up to 0.5 percent. The board resolution does not express specific support for the tax but it does ask that any board with taxing authority be elected rather than appointed and that each municipality be allowed to approve or disapprove a transit tax. 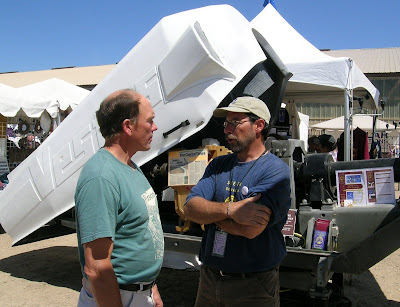 Rick Adamski (left) began researching wind turbine options at the Midwest Renewable Energy Fair in 2005, where he talked with turbine installer Dave Blecker of Seventh Generation, the company that installed Adamski's turbine. There is a farmer in Northeast Wisconsin who soon won't have electricity bills, in fact the electric company may eventually be paying him. That's because the Maple Grove farmer near Seymour in Shawano County has installed one of the first wind turbines in his area on his own property, with the help of federal and state grants. Look across the snow cover fields of Full Circle Farms in Maple Grove and you'll a 110-foot tall wind turbine with three massive blades. "The wind turbine should last 20 to 30 years," said Full Circle Farmer Owner Rick Adamski. It took hours to install in early February. Adamski watched every step of the process from a safe distance with some neighbors. "We're trying to reduce our impact on the environment," said Adamski. . . .
Adamski's wind turbine still needs some finishing touches and is expected to be turned on the week of February 9th. Soon after that, Adamski won't pay for electricity anymore. It will save him about $7,000 a year. In fact, the turbine will produce more energy than is needed. So, the extra energy will be sold back to WE Energies. Anticipating a decline in electricity sales in 2009, Wisconsin Energy Corp. has frozen the salaries of top executives and implemented a limited hiring freeze. "We have frozen hiring, except for critical operating positions," Chairman and Chief Executive Officer Gale Klappa said. The cost-containment moves were made at the end of the year and announced Tuesday, after the Milwaukee energy holding company reported fourth-quarter earnings that beat expectations of Wall Street analysts. Colder-than-projected weather that drove higher use of natural gas and electricity; declining fuel prices; and income from the new Port Washington natural gas-fired power plant helped the company report better-than-expected earnings in the quarter, Chief Financial Officer Allen Leverett said. We Energies, the main utility subsidiary of Wisconsin Energy, has projected that electricity sales to factories and other large customers will fall 6% in 2009. In the fourth quarter, sales to those large customers fell 9% from the fourth quarter of 2007. Hardest hit, Klappa said, are paper mills, auto parts suppliers and basic metal companies such as foundries and specialty steel companies. "Just having talked to a few of our largest customers over the last couple of weeks, my sense is we're not at the bottom yet in terms of the impact of the recession," he said. A Michigan utility company wants to build what it’s calling the Green Power Express, a super-sized transmission line that would link wind-power farms around the Midwest and carry their electricity to urban areas where the power is needed. . . . The proposal would involve building massive 765-kilovolt transmission lines — nearly twice the capacity of the biggest lines now running through the state, at 345 kilovolts — and would run through parts of North Dakota, South Dakota, Minnesota, Iowa, Wisconsin, Illinois and Indiana. A conceptual map has the line entering Wisconsin at the state’s border with Minnesota and Iowa, about halfway between La Crosse and Prairie du Chien, and heading east toward what appears to be the Madison area. 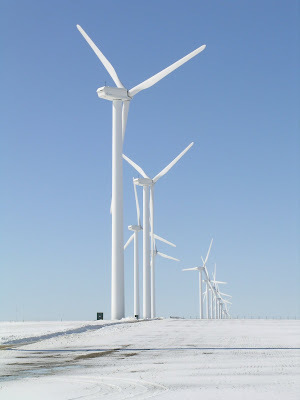 An ITC official did not provide site details. . . .
Wisconsin regulatory officials, utility companies and environmentalists agree that more line capacity is needed to transport electricity generated by the growing number of wind farms. But they’re not sure ITC’s plan for giant-sized lines is the answer. Michael Vickerman, executive director of the Madison environmental group, Renew Wisconsin, said he has "reservations" about the need for 765-kilovolt lines. Smaller transmission upgrades can accommodate new wind generation, he said. Wisconsin Public Service Commission Chairman Eric Callisto also has questions. "I don’t want to close any doors to what they have proposed but I have lots of grave concerns about the cost," he said. ITC is proposing "very large lines" that would require "very large right-of-ways," Callisto said. A right-of-way is the legal permission to use a property owner’s land or the area above it. Callisto is part of a five-state panel — involving Wisconsin, Iowa, Minnesota North Dakota and South Dakota — discussing how to move electricity east from windier western states, and how to pay for that. The group has been looking into 345-kilovolt lines, Callisto said, and hopes to make recommendations this fall. "We have to make sure that what we’re paying for benefits Wisconsin ratepayers," he said. In light of that effort, ITC may be a bit premature, a spokesman for Alliant said. Local presenters are available to make 20-45 minute talks to groups, clubs, and organizations in the La Crosse area on a variety of issues that pertain to living sustainably. Please note that these presentations are not reviewed or formally approved by CPS. Burning Coal and Mercury in Fish: What's the Connection? In addition to releasing enormous quantities of carbon dioxide, coal-fired power plants have other significant impacts as well. Presenter: Mark Sandheinrich, UW-La Crosse. What do recent scientific findings show about global climate change and what can we do to address this problem? Presenter: Rob Tyser, UW-La Crosse. Complete Streets provide safe and accessible infrastructure for all transit choices: cars and trucks, busses, bicycles and pedestrians. It is about improving the quality of life for all residents of a community, as well as reducing our carbon footprint, reducing land used for roads and especially for parking, and improving individual health. Presenter: Charley Weeth, Liveable Neighborhoods and Wisconsin Walks. Learn about “green” projects that have been completed and others that are being planned. Presentation arranged by the City of La Crosse. How does what we value the most in life actually correspond to our spending habits? Presenter: Mark Sandheinrich, UW-La Crosse. In addition to providing critical wetland habitat and outdoor recreational opportunities, the La Crosse River marsh plays an important role in flooding. Presenter: Cynthia Berlin, UW-La Crosse. The “Natural Step”: What Is It? Why Use It? Find out about the Natural Step framework and why municipalities, including the City and County of La Crosse, are using it. Presenter: Rob Tyser, UW-La Crosse. What do images from Landsat satellites show about land use patterns in the La Crosse area? Presenter: Cynthia Berlin, UW-La Crosse. MREA's 2009 workshops now open! The Midwest Renewable Energy Association (MREA) offers workshops that cover a variety of topics in renewable energy (solar, wind, and more). See the course workshops page for a listing of all of the workshops and to register Click here. It’s hard to figure: a governor who endorsed Barack Obama for president when it was a semi-risky thing to do is letting his transportation department show total disrespect for the man now that he holds the highest office in the land. President Obama had made a few priorities absolutely clear: this country must reduce both greenhouse gases and dependency on foreign oil. Gov. Jim Doyle’s WisDOT, in planning for a new Zoo Interchange, is taking a real slap at the president by totally ignoring those priorities. There will be no planning for any transit to be incorporated into the new design, nor will there be a freeway / transit alternatives analysis done, despite the city’s request. It’s a road-only study — more greenhouse gases, more dependency on foreign oil. Guess the governor doesn’t like the president all that much. . . . There is no valid engineering, environmental or geopolitical argument against including transit in the Zoo Interchange project. The opposite is true. The campaign to be La Crosse’s chief executive hasn’t strayed much so far from talking about the familiar troubles — property taxes, jobs and economic development. La Crosse voters will go to the polls Feb. 17 to pare the city’s mayoral hopefuls from seven to two. Last week, the Tribune invited a dozen community members to a roundtable on what they wanted to hear from the candidates before primary day. . . . This week the La Crosse Common Council will cast a vote on an aggressive and contentious city/county strategic plan for sustainability. Lenard helped draft and introduce the plan, which she and Johnsrud called a significant investment in La Crosse’s future. “It’s going to take some money, and some people are going to be reluctant to spend any money,” Johnsrud said. Padesky, Richmond and council member Jim Bloedorn said they’re not willing to hire a full-time employee to tell the city to change its light bulbs and turn the heat down. Some council members will support the plan because it’s “en vogue, but I care too much to foist another artificial bureaucracy on the city of La Crosse,” Bloedorn said. Harter, Richmond and Lesky said they’d support sustainable practices so long as they’re economically justified. A major power line network linking the windiest parts of the Midwest with Milwaukee and Chicago was unveiled today by a Michigan transmission utility. There's no word on how such a project would get built, given longstanding opposition to major high-voltage power line projects, but ITC Holdings Corp. (ITC) said it seeks to address the inability of the nation’s power grid to move power around. ITC has named its project the “Green Power Express.” The express would come through Wisconsin, linking the Madison area with northeastern Iowa and southern Minnesota, according to a conceptual map prepared by ITC. "The Green Power Express will create the much-needed link between the renewable energy-rich regions of the Midwest and high-demand population centers,” said Joseph L. Welch, chairman, president and chief executive of ITC, a transmission utility that is based in Novi, Mich. The project carries a price tag of $10 billion to $12 billion and would span 3,000 miles in Wisconsin and six other states with power lines that carry 765,000 volts of electricity. These lines are capable of carrying much more electricity than the largest lines in Wisconsin, which are 345,000 volts. The project aims to address one of the biggest hurdles seen to having Wisconsin and other states meet targets that would require as much as 25% of the state's electricity to come from renewable sources of energy, such as wind and solar, by 2025. Some of those hurdles were described over the weekend in the New York Times. In short, the best sources where renewable energy can be produced -- states such as the Dakotas and Iowa -- areas that are far from population centers where most electricity is consumed. (MADISON, Wis.) – Leading Wisconsin companies are joining forces to advocate for the meaningful global warming policy changes proposed by the Governor’s Global Warming Task Force (GWTF). The business coalition named Clean, Responsible Energy for Wisconsin’s Economy (CREWE) looks forward to working with other members of the GWTF, the Doyle Administration and other companies and organizations to push for the adoption of policies that effectively and responsibly address global warming and capture the economic development and environmental opportunities in Wisconsin, said CREWE Board Chairman Dan Ebert. Coalition members include Wisconsin Energy Corp., Madison Gas & Electric, Orion Energy Systems, American Transmission Co., Johnson Controls, MillerCoors, WPPI Energy, Potawatomi Tribe and C5-6 Technologies. CREWE is dedicated to joining forces with other supporters to promote responsible policies that address climate change, create jobs, promote energy efficiency, reliability and independence, and mitigate the economic impacts of rising energy costs, Ebert added. The wind energy industry is experiencing unprecedented growth, which is bringing major supply chain challenges to the industry while it aggressively “ramps up” domestic manufacturing of wind turbines and their components. As a result, there is significant opportunity for state and local governments, manufacturers and component suppliers across all industries to help feed the supply chain and grow their business. This state-level seminar will focus on supply chain challenges and opportunities in the state of Wisconsin for companies looking to get involved in the supply of components and services to the wind energy industry. This state-level event is designed to focus on specific aspects for Wisconsin-based companies and to enable their entrance into the wind industry. AWEA is presenting this workshop with the support of The New North, RENEW Wisconsin, We Energies, State of Wisconsin-Office of Energy Independence, Wisconsin Department of Commerce. Good news from Madison for biomass growers? The Charter Street heating plant on the campus of the UW-Madison will switch from coal to biomass before the end of 2010. MADISON—Governor Jim Doyle announced today that a new biomass boiler will be installed at the Charter Street Heating Plant as part of his commitment to stop burning coal at state-owned heating plants on Madison’s Isthmus. The new biomass boiler will be capable of burning up to 100% biomass, everything from wood chips to switchgrass pellets, and will eventually be able to burn about 250,000 tons of biomass per year. This demand for biomass will help create and sustain a biomass market in Wisconsin and provide economic benefit for landowners, farmers and processors in the state. With the switch to biomass, there will be 108,800 fewer tons of coal burned in the area each year and lower particulate emissions. Reducing particulate emissions by moving away from coal at the Charter Street Heating Plant is a key step in working to improve air quality in Dane County and moving the County back into attainment. Southwest Badger RC&D has been working with farmers and researchers on six switchgrass test plots and ways to collect woody biomass to restore native prairie and switchgrass and woodlands. “The state’s demand for biomass will help farmers promote more conservation practices and give us cleaner water and reduced flooding,” said Steve Bertjens, NRCS Southwest Badger RC&D coordinator. In a report released by Wisconsin's Department of Administration, the University of Wisconsin-Stout has once again been found to be the most energy-efficient campus in the UW System. The report "Energy Use in State-Owned Facilities" based its findings on the energy consumption of all UW campuses. Energy consumption is monitored through the campuses' utility bills and fuel consumption. UW-Stout has led the UW System in energy efficiency for over 10 years. Last year, the report found UW-Stout to be 30 percent more efficient than the UW System's average. According to UW-Stout's media release and Physical Plant Director Ted Henzel, energy efficiency comes from the precise maintenance and cleaning of the school's physical plant by UW-Stout's maintenance workers. 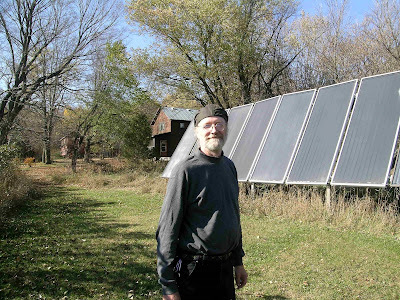 Bob Ramlow stands in front of the solar hot water panels at the Artha Sustainable Living Center near Amherst. With his graying hair in a pony tail and his hand-rolled cigarettes, Bob Ramlow projects the classic appearance of an aging hippie who parted company with the rat race decades ago. And not only does he look every inch the solar energy pioneer, he is one, mentoring installation contractors and counseling prospective system owners in his capacity as Focus on Energy’s solar water heating technical consultant. Indeed, a typical day presents Ramlow with many opportunities to apply his 30+ years of experience in this area, whether it involves reading over site assessments, reviewing drawings and equipment specifications, or advising contractors whenever an installation presents an unusual challenge. . . .
Do you mind being called an aging hippie? Not at all. I was one of many who “tuned in, turned on, and dropped out.” I wanted a fixer-upper with good soil and woods, and I bought the farmland with a nearly ruined farm house built in 1911. We farmed it for 20 years. The old house became the bed and breakfast after we built our new house in 2006. When did your solar addiction begin? In 1971. Dr. George Becker, a fisheries professor, supervised my independent study in my senior year in Natural Resources at the UW-Stevens Point. One day, he told me that “we’re going for a walk” to his house. In his backyard, he had something that looked like an A-frame outhouse. It had an air collector facing the sun, and it was full of rocks to store heat. An air pump blew into his house. I saw that, and a light went on! You could get depressed fighting nukes and DDT, like we did then, but here was something positive! Did the Midwest Renewable Energy Association (MREA) begin about this time? The MREA came a lot later – 1990 – after I’d spent several years of selling high-quality wood stoves, working for a company selling wall mounted air collectors, then another company that sold windows and doors with home installation as a sideline, and I formed Artha Renewable Energy as a solar consulting business in 1976. Mick Sagrillo, now the solar electric consultant for Focus on Energy, and a lot of us in the area were doing a lot of good things by the late 1980s, when George Perez, publisher of Home Power magazine, told us we should strut our stuff – hold fairs and festivals to show off renewable energy. We liked the idea and founded the MREA in January or February of 1990. We held the first fair at the county fair grounds in Amherst in mid-August of the same year. The first day – Saturday — it rained hard. The four holy, moldy Korean-War-era tents, where we held workshops, let the rain pour in. People were squatting on chairs to stay out of the water while they listened to the presentations. Sunday was beautiful. We had 3,000 people and made enough money to hire a part-time director for the next year’s fair. What exactly do you do for Focus on Energy? I mentor solar hot water installers and dealers. Installers call me a lot. They run into a situation that’s unfamiliar, or maybe they aren’t sure exactly how to squeeze all of the equipment into a tiny space, for instance. I help with nuts and bolts issues. I review solar site assessments too – probably one a day on the average. Focus on Energy’s call center also refers homeowners, business owners, and school district staff to me when I seem to be the most appropriate person, though most people call their utility or a dealer first. Sometimes for Focus on Energy and sometimes for the MREA, I teach classes, often to employees of heating and plumbing contractors. We’re currently working out the details for me to train installers for one of the largest contractors in the state. La Crosse, WI (WXOW)- Gundersen Lutheran is one step closer to becoming energy independent thanks to the La Crosse City Brewery. "People in the La Crosse community have seen these flares for many years and we approached City Brewery and said this would be a unique partnership and a wonderful partnership to capture this waste methane, waste energy, going right now and just being released," says Corey Zarecki, efficiency improvement leader at Gundersen Lutheran. The combined heat and power project is located on the City Brewery's Property. Waste methane gas discharged from the Brewery's waste treatment process is being turned into electricity. The process is expected to generate three million Kilowatt hours per year. "We're gonna be generating electricity and putting that to the grid as clean renewable energy source," says Corey Zarecki. The project is expected to generate 8 to 10 percent of the energy used at Gundersen Lutheran's La Crosse and Onlaska facilities. That is enough electricity need to power 280 homes. The Renewable Energy Summit opened online registration for the event at the Midwest Airlines Center, Milwaukee, March 25 - 28, 2009. Fifteen program themes highlight bio industry energy; business technologies and practices; curriculum programs and course design; energy efficiency, energy management and renewable, sustainable and green practices; energy policy, legal issues, drivers of the energy revolution, and opportunities for funding; green career pathways; green manufacturing; greening practices for colleges; green transportation; solar electric energy; solar thermal and geothermal energy; utility issues; water technologies; and wind energy. March 25 and 26 focus on the renewable energy industry with presentations on all sectors of the industry. March 27 features Green Career Day with the focus on educational and job opportunities. March 28 offers workshops and short courses at the MATC Oak Creek Campus. For details see www.renewableenergysummit.org. For the first time ever, River Falls made the Environmental Protection Agency’s list of top 21 Green Power Communities in the country. The city made number 10 to be exact, with a 5% participation rate and deriving 15% of its energy from renewable sources. Not only is it River Falls’ first time on the list, but also it’s the first city in Wisconsin or the Midwest to make it. River Falls Municipal Utilities Communication Coordinator Chris Blasius said RFMU has been eyeing the list for years, waiting to apply for the status if and when River Falls ever met the EPA’s criteria. The city hit that magic mark this year. Blasius said the main thing that landed the city on the list is how much it spends on renewable energy. The Renewable Energy Summit opened online registration for the event at the Midwest Airline Center, Milwaukee, March 25 - 28, 2009.